Enterprise, OR -- Old man winter is on the retreat! It’s time to trade the Bog boots for the Chaco sandles and the stouts for the summer pale ales. We’re proud to introduce a new seasonal bottled beer for the season’s enjoyment. 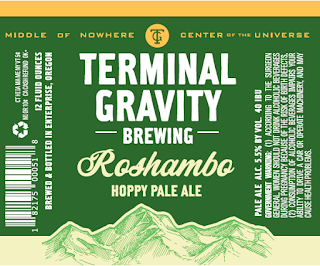 Roshambo Hoppy Pale Ale is an American Pale Ale brewed with copious amounts of Denali and Eureka! hops. It begins with the aroma of fresh cut pineapple and citrus, and gives way to a light and crisp malt bill, ending with a slight bitterness (just 40 IBU’s) reminiscent of melon rind. We’ve been refreshed by this beer, and at 5.5% ABV it’ll have you reaching for another. Denali hops are the real story here. We picked this hop up about a year ago when it was still #06277, an experimental hop with genetic origins from Nugget and Zeus. It wowed us with a new sort of citrus, allowing us to shed the winter blues and see July on the horizon. So shake off that winter coat and chill down a sixer of Roshambo...spring is just ‘round the corner. Available in 12 ounce bottles, tucked into 6-packs. 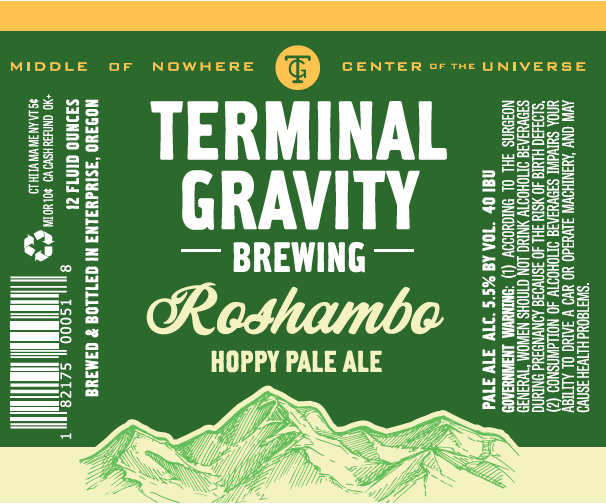 You can find Roshambo at Market of Choice, New Seasons Markets, Fred Meyer Stores, Safeway, Zupans, and wherever TG is sold. 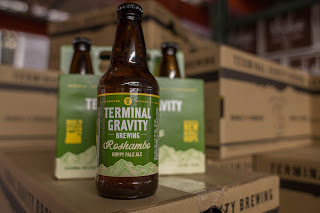 Terminal Gravity Brewing is located in the small town of Enterprise, Oregon. Just a quick 320 miles from Portland, we’re nestled in the foothills of the Wallowa Mountains. We cut our teeth on craft brewing twenty years ago and drove the first kegs of TG IPA to PDX in the back of a pickup truck, eight kegs at a time. It quickly became a favorite of beer drinkers all over the PNW. Twenty years later we’ve kept our roots a priority all the while envisioning and executing an exploratory path among new IPA’s, Pilsners, American Lagers, and Barrel Aged Beers. Our beers are an ode to our place, our people, and the kind of life worth living.